The art of being healthy and happy is being vitally strong in both body and mind. 1. exuberant physical strength or mental vigor. 2. capacity for survival or for the continuation of a meaningful or purposeful existence. So, this coming week prepare yourself for boosting your mental faculties by attending the Lancashire Science Festival. Make a firm commitment to attend at least one of the days of the event. Take a child with you and encourage them to dream big. Even prepare yourself physically for being there all day by doing something for your health. Drink less alcohol. Drink more water. Try a green juice. Eat less bread. Have a day eating no processed food, i.e. nothing out of a box, packet or wrapper. Go for a day without caffeine. Go for a day without sugar. You might even take time out to relax, rest, and recuperate. Do some diaphragmatic breathing, meditation, or yoga. Go for a massage. Go to bed early. Or simply take a walk in the park alone and take a moment to appreciate the beauty of the natural environment. So, what is the Science Festival ? This year’s theme is Power Up! Join us as we Power Up for a 3 day celebration of Science, Technology, Engineering and Maths! How to power up your brain (Find out how to improve your memory, and really get those neurons pumping). 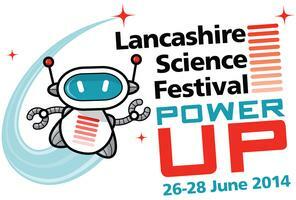 For more information visit Lancashire Science Festival.